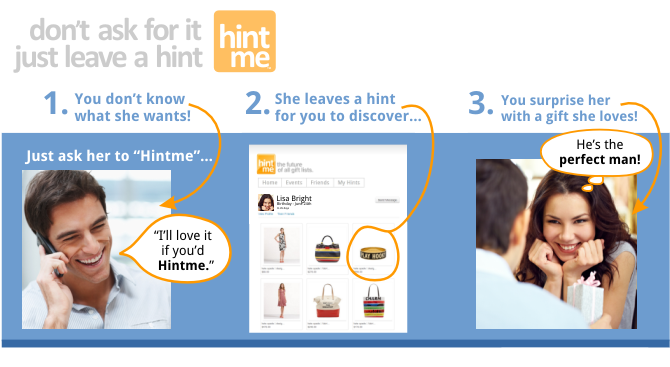 Hinted on Hintme, the World's Hint List. It's easy! Just drag this Hintme button into your browser bookmark bar. When you find something to hint, click the button and it will be saved to you account. If you are using a browser which doesn't support drag-n-drop bookmark creation, please follow these steps. 1. In your browser create a new bookmark called "Hintme!". 2. Select and copy the code below. 3. Edit your new bookmark, paste the copied code into it and click save. For more help please see our Hintme FAQ page. Hintme is FREE. Join your friends! Login with your Facebook account? Would you like to login to Hintme using your Facebook account? If not, please log out of your Facebook account to continue. I don't know what you want. Hintme! Located in awesome Portland, Oregon. Come join us!